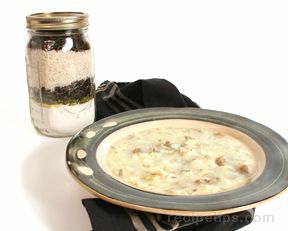 The dry ingredients of this satisfying wild rice soup are measured and jarred as a ready-to-use soup mix, allowing you to prepare it whenever an easy, quickly prepared meal is required. Layer the ingredients in the order given into a wide mouth one quart canning jar. Cover the jar tightly with a canning jar lid. Attach a gift tag on top of the jar with the cooking directions on it. Place creamy wild rice and mushroom soup mix into a large soup pot. Heat to boiling then reduce heat, cover and simmer for 20-25 minutes or until the rice is tender.